The Philadelphia Eagles finally got the monkey off their back that was the Washington Redskins in a 30-17 win in Washington last Monday morning. The final scoreline could indicate a comfortable victory, but in typical Philadelphia sports fashion this was anything but that. Cornerback Jalen Mills picked off Washington quarterback Kirk Cousins in the fourth quarter withe the Eagles leading 19-17 before a questionable call on a fumble from Cousins resulted in a Fletcher Cox touchdown with 1.29 remaining. It was the Eagles first win in three years over their divisional rival. 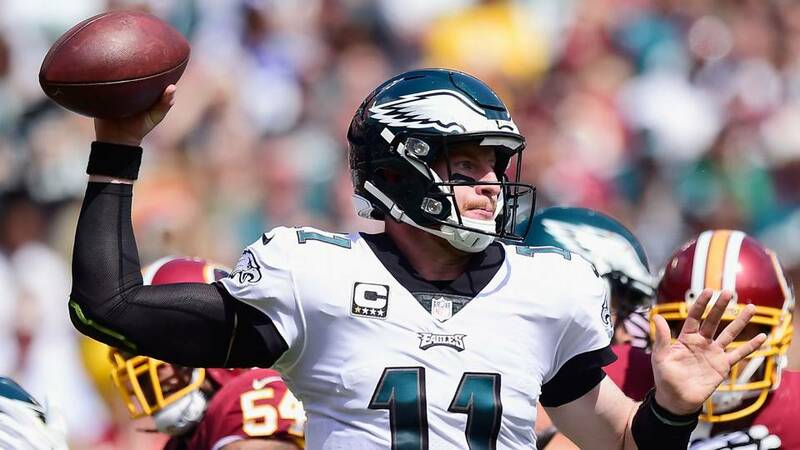 Carson Wentz on a third and long in the first quarter evaded multiple pass rushers before slinging the ball down the field into the waiting arms of Nelson Agholor who competed the 58 yard score. It was a thing of beauty for both QB and receiver, who have had to endure an off-season of question marks on their potential. The defensive line hassled and swarmed Cousins all day long. The Washington offensive line is one of the better going around. Cox was particularly destructive, as was Timmy Jernigan and Brandon Graham. Wentz had a good command of the offence, making 26 completions for just over 300 yards. His ability to evade a tackle for such a talll guy continues to impress. Tight end Zach Ertz was in December form in September and led the team in receptions (8) and yards (93). Agholor gave glimpses of what the Eagles saw enough in to invest a first round pick. Forcing four turnovers helped the Eagles possess the ball for over 34 minutes. A dislocated ankle to Ronald Darby was hard to watch and saw fans despair their hopes for the improvement at the cornerback position, a long time trouble for the team. Thankfully Darby will only miss 4-6 weeks and the play of Mills gives hope that this period without the number one corner can be survived. The running game looked weak again. LaGarrette Blount ran the ball 14 times, mostly up the middle, but only averaged 3.3 yards per carry. He did look like the short yardage back they need him to be on occaison however, if used properly. Doug Pederson’s play calling was curious at times. Not going for it on 4th and 1 at midfield just before the half you when you have Blount for example. It was plainly obvious that they were playing for a penalty and the Redskins made them burn a timeout as a result. Alshon Jeffrey only caught three passes and dropped a wide open reception in midfield. A trip to Kansas City to face one of two head coaches to take the Birds to the Super Bowl, Andy Reid. The AFC West champion Chiefs are coming off a huge win over New England in Boston and have talent all over the field. A win in this one on the road will stamp the Eagles as a legitimate contender.